In the world of mechanical watches, names like Seiko and Rolex are the brands everybody knows. The proliferation of micro-brands using standard Sellita or ETA movements means there’s not a huge opportunity to differentiate watches sold by lesser known brands, unless the ‘standard’ movements they tend to use are being heavily modified; it's strictly the look of the watch that sets it apart. The Orient brand is one exception. As a Japanese company, they started out competing with Seiko and Citizen in the Asian watch market. Now owned but Seiko, they operate as an independent watch company, complete with original designs and in-house movements that are amazing value for money. The watch enthusiast looking for something a little more than the average can find what he's looking for here. 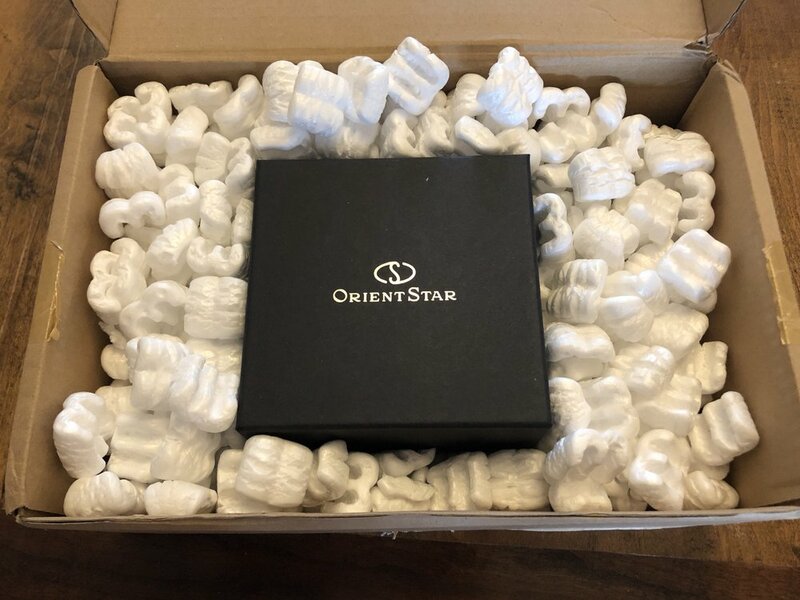 Orient markets their standard watch line both in the American and Asian markets, but the Orient Star - a higher priced line - seems to be focused primarily on the Asian markets, and they are a bit harder to find in the US except through gray market dealerships. I purchased my Orient Star Retrograde from Creation Watches, which is based in Singapore. Their excellent free shipping meant a Friday order arrived on Monday afternoon - which blew my mind! Depending on the price point of your order with Creations Watches, you may or may not receive a branded watch box. My Retrograde came in a very nice Orient box, and was well packed. Opening it was a treat! The watch is placed on a black velvet style pillow that comes out very easily, and since it was a new watch was wrapped in plastic, tagged, etc. Hour indices are very pronounced and sit quite proud of the dial, while each sub dial is slightly recessed. The day dial also sports a polished edging to set it apart from the main dial, while the date and power reserve have a very tiny metal band outlining their edges. The hands are very angular, polished on one side and matte on the other which is intended to aid readability. The sub dial hands are not consistently styled, sometimes it feels rather like the Retrograde day hand is pulled from a different watch altogether! The power reserve and date hands, while not identical, are similarly styled with a triangular look which is congruent with the hour and minute hands. The retrograde hand has a more smoothly tapered design, and it could be shorter - it obliterates the text on the subdial. There is a lack of consistency here; each subdial kind of doing its own thing in terms of where it lands on the indexes. Not a complaint, just an observation - an easy opportunity for perfection. The retrograde function is quite fun - rather than a circular dial, the retrograde hand will snap back to the first index after it reaches the last one. So, at the end of Sunday, it snaps back to Monday. This is a run and uncommon complication that is one of the main things that drew me to this watch. 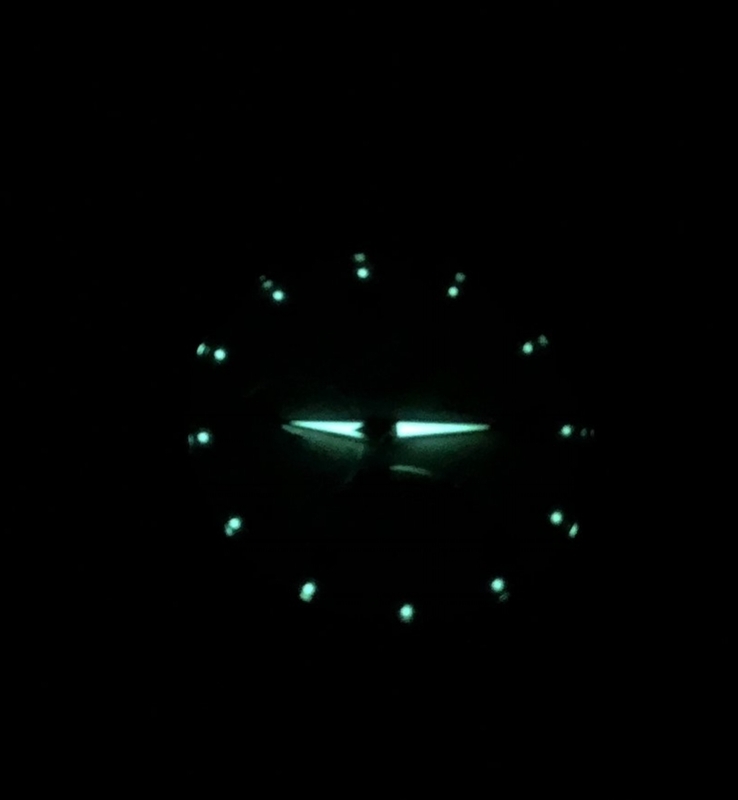 The lume is small and does not have a lot of staying power; for a dress watch it's probably not even necessary. The dial is overall very readable, though the small text of the date may be hard to read with a quick glance, and at times the minute hand can make it hard to read the date at all, but that is to be expected. The movement is an Orient 40A50, 22 jewel movement that is both hacking and hand winding capable. On mine, using a timegrapher app on my phone, it gains about 5 seconds per day - which is not bad given the price. Conveniently, I can look at the official time app on my phone once a day, pull the stem out for about five seconds, push it back in and I’m basically in sync! The watch is incredibly quiet too...put your ear to it, and you won’t hear much; the rotor is also very quiet. The movement is decorated with Cotes de Geneve, a nice touch for a watch at this price point. The automatic winding seems very efficient, I have no trouble keeping the power reserve at maximum in the normal course of a day, even with my fairly sedentary job. A quick wind on weekends is indeed all that is needed to keep it running. Winding the watch is a joy, with just a small amount of resistance, and it really is quite fun to watch the power reserve move. The case is polished stainless on top, and brushed on the sides. The lugs are beautifully shaped and meld in nicely with the bracelet, which combines brushed and polished portions of the links in a very tasteful way. Overall the watch comes together as a splendid unit, elegant in appearance and classic in design. The sapphire crystal is domes ever so slightly, and has held up to my wear and tear without fail so far. Overall, this is an excellent watch for anyone who is looking for an interesting automatic. The retrograde function is not too common, especially at this price point, and the in-house movement is a treat as well. The build quality is really quite fine - probably not Seiko Presage quality, but close. Overall, I definitely recommend this Orient Star Retrograde. Seiko is the premier Japanese watchmaker and has been in business since 1881. Their Seiko 5 series provides excellent value as they can usually be had for less than $150, and very often less than $100. For that price, you get a watch with an automatic movement, with day/date function. The Seiko 5 series of watches come in many styles and provide a basic automatic movement in a stylish case. Introduced in the 1960s, the Seiko 5 series is the black horse of the mechanical watch market. The '5' represents the five functions: hour, minute, second, day, date. The series uses the venerable Seiko 7S26C or 7S36 movements, running at 21,600BPH and having a 40 hour power reserve. 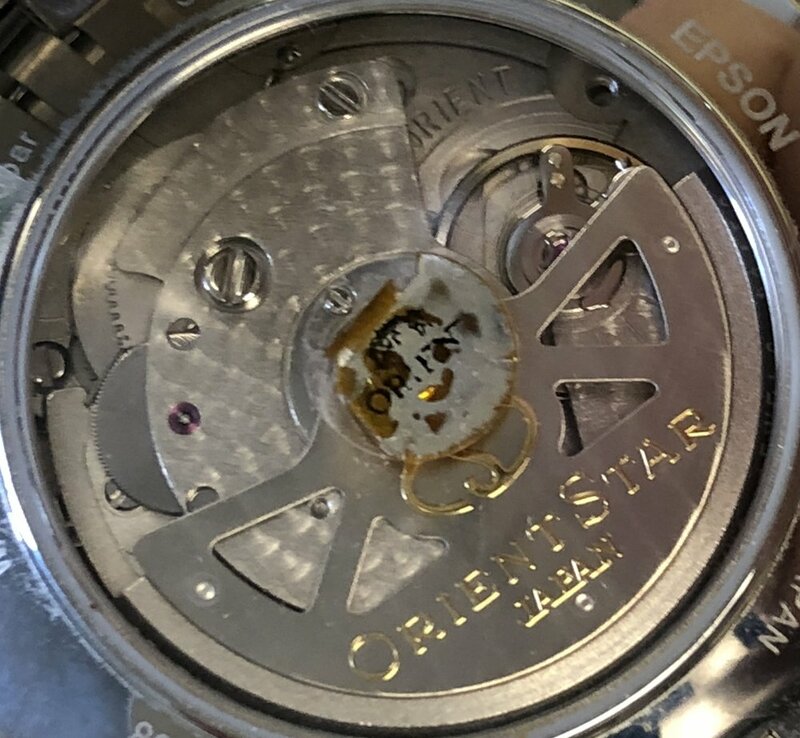 Hacking and hand winding is not supported - though in my experience with the SNK 809, I could give a slight back pressure to the crown in the time set position, and cause the second hand to stop or even run backwards. So it CAN be done, if you want to set the time accurately. From the factory, however, these watches tend to run -/+ 8 seconds per day, however, so it's not so critical. With some regulation, this can be brought down to about -/+ 2 seconds per day. The SNK 809 that I had was very comfortable, and the 37mm case was not overly large on my wrist. I would not care to go any smaller, but I feel the 37-42 mm size is probably a good range for me. On beefier fellows, this watch may appear rather tiny. I'm very fond of the military style watches, and so went for the SNK series over some of the dressier Seiko 5's out there. I found the watch to be quite rugged, especially as I tend to work outside quite a bit. The lume was bright and clear, and I overall felt the watch - and no doubt the entire Seiko 5 series - has a good overall fit and finish. The wrist band is a cloth style that is a bit irritating, but of course this can be easily replaced. This line of watches could definitely play a good role in introducing folks to mechanical watches, and would be a good start for any fledgling collector. Sadly, after a couple of mishaps in the dryer (left it in my pocket!) the rotor simply wouldn't wind it anymore, so this Seiko has gone away. I would definitely have another at some point, though. Lesson well learned.